Our Favorite Chalk Pastels - You ARE an ARTiST! What are our favorite chalk pastels? With our chalk pastel art tutorials we have always suggested that you simply start with a beginner set of chalk pastels. A simple starter set of about 12 chalk pastels can be shared among your children and purchased for around $10. ~Don’t miss the giveaway at the end! This post contains affiliate links to art supplies we adore. If you click on the links, you won’t pay anything extra but you will help us continue to offer frugal art for all ages. Thanks for that! Once you have tried chalk pastels for a while and decided you love them, you can get a larger set. 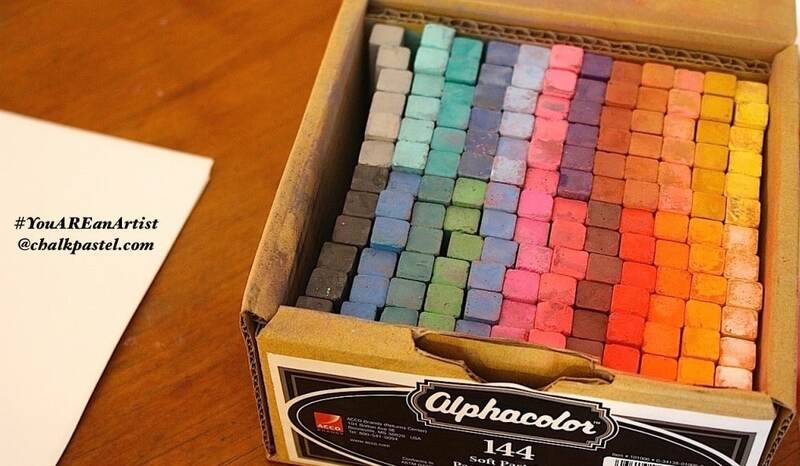 Or you can go for the Alphacolor set of 144 chalk pastels that Nana gave us as a gift! One of the reasons we love chalk pastels is simply because this medium is frugal art for all ages. As a teacher and a mother, I know I have been intimidated by a long list of expensive art supplies. The fear of the cost and the fear of simply being able to accomplish the art time would make me not even attempt it. At ChalkPastel.com, we think that art time should simply be easy to do. Creative times can even be spontaneous. But they can always be fun! Why? Because you ARE an artist! Guess what? You can even break a chalk pastel stick in half to share! In celebration of the opening of the You ARE an Artist Clubhouse, we are giving away one (1) Prismacolor set of 144 chalk pastel sticks (pictured at top and valued at $47.39) to TWO (2) artists! Head over to ChalkPastelArt Instagram to enter to win!